Night of the Zombie King expands on the world of Gold, where being good at tabletop role playing can make you a star. Who hasn't thought it would be great if your exploits around the table with your friends every week slinging dice were the focus of a spectator sport? Well, that's the premise of GOLD, a web series which debuted in 2008 and told the story of the struggling U.S. team as it prepared for the World Goblins & Gold Role Playing Game Championship. After two successful seasons, the creators of GOLD have turned to a secondary character, Jamison "Jaz" Colier, as he goes back to the hometown he left 15 years ago for a nostalgic night of RPGs. "We talked with the fans about what they'd like to see more of," said creator David Nett. "Andrew Deutsch, Rick Robinson & I used that information to build a show around one of the minor characters from GOLD Season 1, which allows us to tell this amazing new story without disrupting the main GOLD storyline." 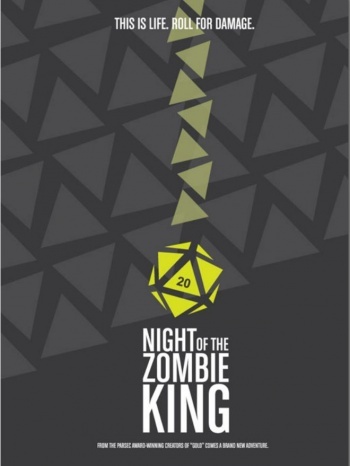 Nett calls Night of the Zombie King a Big Chill story for the gaming culture. "The internet is a big place so it's hard to be certain, but we believe Zombie King might be the first real drama about the gamer culture," said Nett. "While it stays true to the characters and world of GOLD, the tone is very different, which is an exciting experiment for us." Episode 1-3 of Night of the Zombie King is up already with a fourth episode slated to come out this month. Head over to Goblinsandgold.com to check it out.